Studded with fresh pomegranate seeds and filled with condensed milk, these colorful bar cookies are at once tangy and sweet. They are perfect for early fall, when pomegranates first come into season. The fruit grows predominantly in India, Iran, California, and the Mediterranean region, and is used in a variety of sweet and savory dishes. In Greece, for instance, the seeds are used to glaze kebabs, incorporated into eggplant relish, and sprinkled over ice cream. 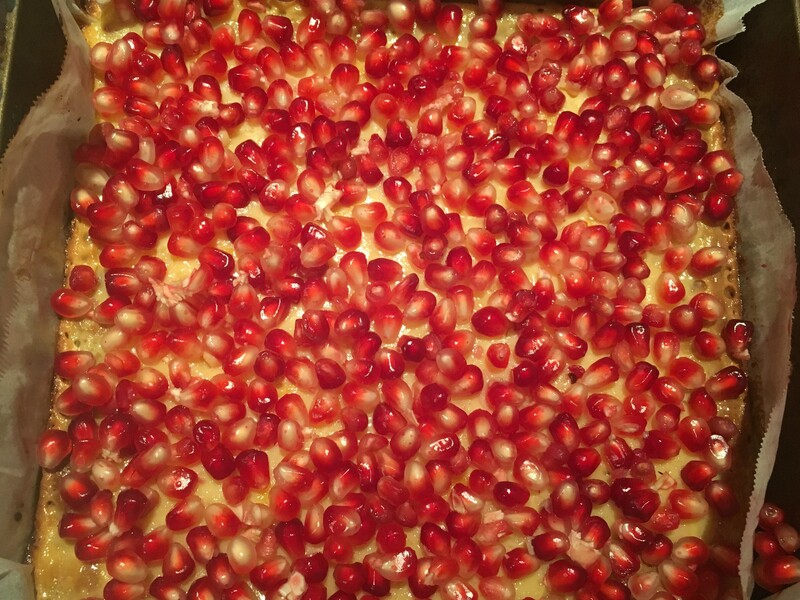 This recipe is my spin on the use of pomegranate seeds in desserts. I created a condensed milk and egg yolk filling based on that of key lime pie, swapping lime juice for apple cider to maximize the autumn flavors, and poured it over a date-walnut crust. Preheat oven to 350 °F and line the bottom of a square pan with parchment paper. In the bowl of a food processor, combine walnuts, dates, salt, and sugar. Add butter and flour. Bake crust for 15 minutes, until golden brown. Set aside to cool. In a medium bowl, mix condensed milk, egg yolks, and apple cider until smooth. Pour over crust. Bake for another 20 minutes, until filling is set. Sprinkle fresh pomegranate seeds on top. Once fully cool, cut into squares. To store, refrigerate in an airtight container.